Our ongoing collaboration with OTAA has been a success since day one, and we thought we’d show how we choose to pair ties in different contexts. 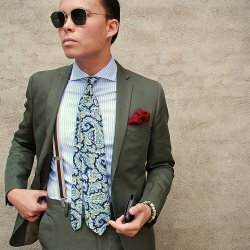 The following articles displays our process when picking out the perfect tie for the everyday outfit, and our thoughts put behind the selection when having different settings regarding patterns, textures etc. Our main tie supplier, our friends from Down Under, OTAA Australia, always does a great job designing great neckwear whether it’s for the light summer outfit that needs a brightly coloured paisley upgrade or a heavy earth toned wool tie, they got you covered. We’ve picked out a few examples on how we combine ties with shirts, jackets and pocket squares, striving for putting together the outfit perfectly balancing formal and casual depending on the occasion. The first outfit consists of a beige, cotton sport coat with a striped blue contrast collar cutaway shirt underneath, paired with a yellow knit tie with subtle diagonal stripes woven into. The pocket square with shades of blue, violet and yellow blended together in big paisley. Concerning the colours this outfits consists mostly of blue and yellow shades, as said before light and bright colours, that goes well for the summer season. Having a solid colored jacket gives a lot more freedom pattern wise for the rest of the outfit. The striped shirt and tie doesn’t interfere with each other, firstly because of the width of the stripes and secondly because of the direction. Wide diagonal stripes on the yellow knit tie goes well with the narrower blue stripes of the shirt, giving a clearer contrast of both items by using complementary colors. By having the blue color centered, the surrounding yellow shades gets enhanced. In this outfit we’ve focused on combining shades of blue. A blue and white seersucker sport coat, a light blue cutaway spread collar shirt with a smooth Fleur de Lis tie. In our mind, shades of blue goes well together as long as it’s mixed properly. This outfit is an example on how we deal with multiple shades of blue and the choosing of a tie for it. The two main elements of the outfit, the tie and jacket, has several contrasts; firstly the fabrics. Seersucker fabric gives a rough wavy clothing frame, contrasting the smooth silky fabric of the tie. Secondly the colours, the two components has two totally different color shades, making sure both of them gets enhanced by choosing a tie with complementary shades of blue. The light blue shirt does not interfere with the overall look by staying subtle in the background, while keeping the blue outfit together. The same thing goes for the solid navy trousers and the raw linen pocket square, by not playing a major role, but these elements provide another blue shade without being too loud, giving all the attention to the tie and jacket. It’s no secret that we’re very fond of knit ties in almost any aspect. With a multi coloured madras sport coat, there’s a wide variety of colours to choose from. We like to match of the colours presented in the jacket with a beautiful pointed knit tie. In this shot we’ve let the jacket be louder than the tie, while the tie plays a supportive role along with the white green bordered pocket square. Having a plain blue cutaway shirt underneath, the jacket and tie is left to do the talking. As seen in an earlier posted picture, the same sport coat is matched with a solid burgundy knit tie, also complementing the red tones present in the madras check. Overall this outfit has a more casual vibe to it, making it suitable for preppy everyday usage. With this casual setup, we’ve put on a classic blue and white striped, button down oxford shirt and mixed it with a more formal silky regimental striped tie, all wrapped in a grainy unconstructed linen sport coat. 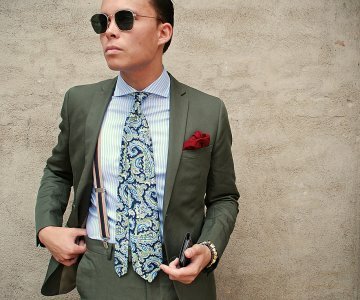 The tie serves a formal purpose with this outfit, lifting the level of formality for the whole outfit. It stands out colorwise by being in darker tones compared to the other elements, while simultaneously contrasting in fabric. The grainy sport coat has a mild rough touch to it, matching the raw linen pocket square in terms of fabric, while the tie has it’s smooth surfaced fabric. The beige espadrilles contribute to a more casual vibe, matching the sport coat in terms of color and touch. As aspiring sartorial enthusiasts with a playful approach we always pay attention to details. All in all, when finding the right tie for the general outfit, we’re paying great attention to detail, making sure almost nothing is left to chance. Summed up, the main pointers will be, not to wear patterns or stripes, too adjacent, but when wearing stripes or patterns, we like to make sure, there’s a certain amount of contrast. The same thing goes for colours, fabrics and textures – contrast is a keyword. Learning clever ways to utilize the colour palette can really serve you well. With that being said, we still like being creative, when pairing items. Like some of the outfits above, we mix shades of the same color or same type of texture, as long as it’s thought out when put on. We’d like to finish off with a quote from the great Neapolitan tie makers, Maison M. Cilento. The quote boils down our thoughts on creating the perfect outfit.